Don’t forget to read the catalog post BELOW THIS! Aqua Grabber has been updated early, you can now use it to look for underwater treasures. There are pearls hidden inside each oyster. Normal pearls are worth 25 coins, while the special black pearl is worth 50 coins. The black pearl is hidden in a different oyster every time. To get a pearl, you need to hover above the oyster until he falls asleep (don’t bump into him or he’ll wake up), then when his mouth opens remove the pearl. You don’t have to bring pearls back to the net. There’s a new location at the very bottom of the ocean, it’s where you’ll find the treasure chest (worth 100 coins). Once you pick it up, loads of fish will appear. If you bang into these you drop the treasure chest & fill up with water, just like rocks & stuff. It’s pretty tricky since the fish keep moving. Just keep trying, you’ll get there eventually. Then you see your score. 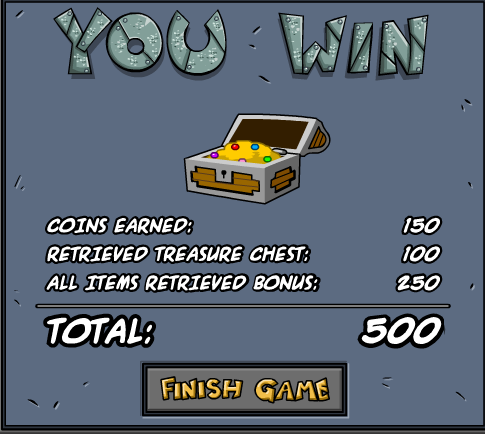 For collecting all the treasure, you get an extra 250 coins!! 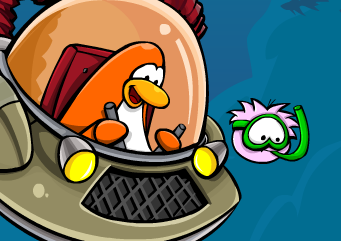 You are now able to bring your pink puffle with you too! She wanders around underwater & sometimes she might blow some bubbles at you.